Can an apple orchard bring true love? For Grace Lyndon, it can – in the form of the most fabulous smell she’s ever come across. Grace, a stiletto wearing workaholic, works in the world of perfumes and flowers, finding perfect scents to chemically reproduce for companies she works for. For Dylan Jackson, it already had – a widowed single father, his first wife bought and loved the apple farm that Grace is determined to gain access to. 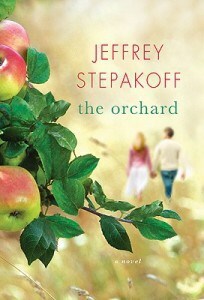 In The Orchard by Jeffrey Stepakoff, Grace & Dylan have a sudden, yet undeniable attraction. Can the apple orchard bring these two very different people together? I loved this book! It was a whirlwind romance reminiscent of Nicholas Sparks. It was obvious that the characters wanted each other. They were spontaneous and surprisingly accommodating to their attraction, yet Grace & Dylan weren’t childishly irresponsible about it. The two were testing each other, honest and revealing. It was such a refreshing, pure, loving romance that I couldn’t put it down. I could SO see a movie being made of this story. I loved the complexity of the characters. I loved that the romance didn’t feel guaranteed (though it did work out in the end). And I loved the backdrop of the story. When fictional books share knowledge about something new, I feel like I’ve not just read a good novel, but have learned something, too. His information about the world of commercial uses of scents and flavors was fascinating and now I notice it everywhere. The Orchard by Jeffrey Stepakoff was a fabulous book from several different angles and I would recommend it to anyone who loves a GOOD romance. I can’t wait to see his next book! The cover alone would make me pick it up and want to read it. Sounds lovely. Appeals to my senses, hmmm.